The Score Editor can display MIDI regions on a software instrument track. Notes, rests, and other musical events in the MIDI regions on the track are displayed in standard musical notation. Click a software instrument track header, click the Editors button in the control bar, then click Score. Select a MIDI region in the Tracks area, click the Editors button in the control bar, then click Score. Region Name field: Edit the name of the selected regions. Time Quantize pop-up menu (with Strength slider): Quantize the timing of notes in the selected regions. Transpose slider: Change the pitch of notes in the selected regions. Insert pop-up menu: Choose the note value for notes to insert. Time Quantize pop-up menu: Quantize the timing of selected notes. Velocity slider: Change the velocity value of selected notes. 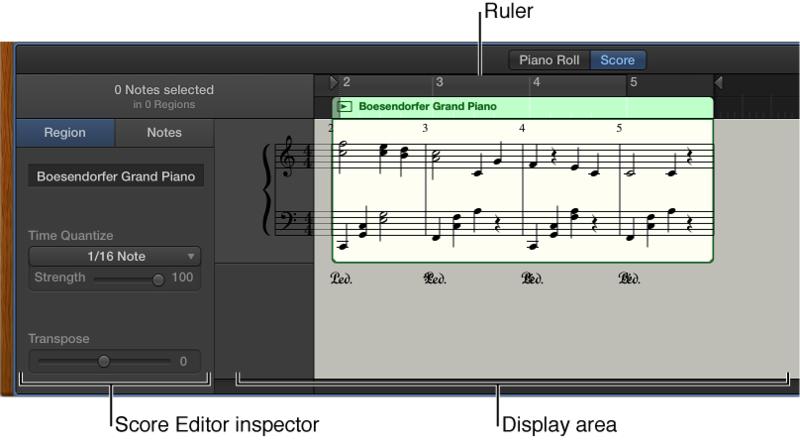 In addition, the Grid pop-up menu appears in the Score Editor menu bar, so you can set the visual quantization of notes in the Score Editor, independent of their Time Quantize value.